The Swiss Franc pulled back against the US Dollar yesterday but prices failed to reclaim a foothold above support-turned-resistance at 0.9038, the 38.2% Fibonacci expansion. A daily close above this barrier initially exposes the 50% level at 0.9081. Alternatively, a reversal below support at 0.8986, the 23.6% Fib, eyes a rising trend line set from mid-December (now at 0.8950). On balance, positioning is little-changed from yesterday, with prices oscillating in a choppy range around familiar levels and offering little by way of a discernibly attractive trade setup. We will keep to the sidelines for now, waiting for something actionable to emerge. Swiss Franc technical positioning is little-changed from yesterday, with prices treading water above 0.90 to the US Dollar. A daily close above support-turned-resistance at 0.9038, the 38.2% Fibonacci expansion, exposes the 50% level at 0.9081. Alternatively, a turn below support at 0.8986, the 23.6% Fib, targets a rising trend line set from mid-December (now at 0.8954). Yesterday’s price action formed a Doji candle, pointing to indecision below resistance and hinting a move lower may be ahead. Confirmation is absent however, arguing against taking a short position. Meanwhile, taking a shot on the long side looks unattractive from a risk/reward perspective. We will hold off on taking a trade at current levels. -On 12/27, USDCHF spiked to its lowest level since November 2011. The advance from the 12/27 low is impulsive (5 waves). As such, it’s possible that an important low is in place. -The rejection at former lows (June and August lows) has given way to a larger dip. The market needs to overcome .8940 (daily closing preferably) in order to make the case for higher levels. .8831/59 is the final level of possible support before the December low (the market reacted here on Wednesday and Thursday). If .8800 gives way, then focus would shift to the October 2011 low at .8567. Prices stalled at trend line resistance set from late January after the US Dollar produced its strongest push upward in a month against the Swiss Franc. A break this barrier (now at 0.8880) initially exposes 38.2% Fibonacci retracement at 0.8921. Support is in the 0.8848-66 area,marked by the December 2013 closing bottom and the 23.6% level, with a break below that eyeing the February 28 lowat 0.8776. The pair is trading too close to relevant resistance to justify a long position from a risk/reward perspective. On the other hand, a short position seems premature absent a defined reversal signal. We will remain flat for now. Trading within ranges amidst irregular patterns appears to be the flavor of the week, and staying with that theme, the weekly chart of NZDCHF currently shows one of the oddest looking diamond patterns seen in recent memory. Of course, skeptics could simply focus on the triangle portion, which is the second half of the diamond formation. As seen above, it is clear enough and is relatively uncontroversial in comparison. From an analytical standpoint, it will not make too great a difference. The daily chart below indicates resistance overhead, as price begins an extension move upwards. All that remains is to identify a logical zone of resistance where new short trades can be initiated. This will be in line with the weekly chart's downward trend, which means that overall risk profile should certainly be in order. The actual resistance zone is derived on the four-hour chart below, as is customary for trades taken on the hourly time frame. Price action has been somewhat messy on the four-hour chart, but the final zone of resistance is ultimately identifies as 0.7503-0.7542. Price has yet to reach this zone, which should leave traders plenty of time to prepare for a possible entry. The hourly chart actually shows some mixed signals for this trade. In particular, there has been some bullish price action of late. However, this is tempered by the hidden line of support turned overhead resistance. With some luck, which is always helpful in consolidating markets, this level will continue to hold. As usual, the ideal trade triggers would be bearish reversal divergence, pin bars, and/or bearish engulfing patterns on the hourly chart. With the weekly trend potentially resuming from here, it is definitely worth taking two or three tries at getting in on this trade. The risk zone is less than 40 pips wide afterall, and an hourly entry will likely provide stop losses in the 15- to 20-pip range. The US Dollar roseas expected against the Swiss Franc but the likely way forward is obscured by conflicting technical cues. In one scenario, a pullback from resistance at 0.8873, the 38.2% Fibonacci retracement, looks like a correction offering a long entry setup in the context of a falling channel breakout. In another, a bearish Evening Star candlestick pattern suggests a reversal lower is in progress. We will stand aside for now, looking for clarification before committing to a directional bias. The bearish scenario would appear more probable following a daily close below the 0.8806-13 area, marked by the channel top and the 23.6% Fib. The bullish case would appear more compelling if prices produced a defined upside reversal signal at support. The US Dollar began to recovery against the Swiss Franc as expected and more of the same appears to be likely in the period ahead. Conflicted positioning that has plagued the pair recently seems to be starting to tilt in favor of the bulls after prices bounced from falling channel resistance-turned-support, lending credence to last week’s upside breakout. 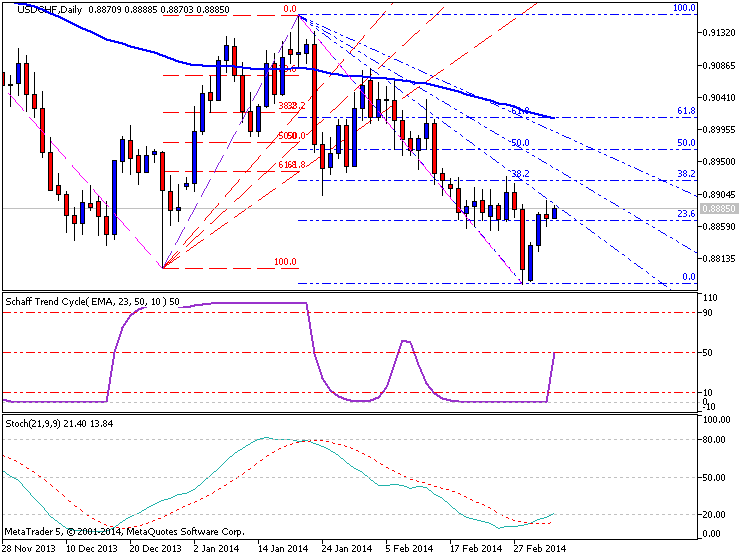 A close above the 38.2% Fibonacci retracement at 0.8873 exposes the 50% level at 0.8927. Near-term support is at 0.8806, the intersection of the channel top and the 23.6% retracement. At this point, prices are too close to relevant resistance to justify a long position from a risk/reward perspective. We will continue to stand aside, looking for the pair to produce a more attractive trading opportunity. The US Dollar moved higher as expected against the Swiss Franc after prices produced a bullish Piercing Line candlestick pattern. A break above resistance in the 0.8952-56 area – the 100% Fibonacci expansion and the April 4 high – has cleared the way for a challenge of the 123.6% level at 0.9016. A daily close above that exposes the 138.2% Fib at 0.9053. A reversal back below 0.8952 aims for the 76.4% Fibat 0.8896. While a long a position seems workable from a risk/reward perspective, we will tactically opt not to pursue it. The inverse correlation between USDCHF and EURUSD is now 0.92 on 20-day percent change studies, and we already have a short EURUSD position. 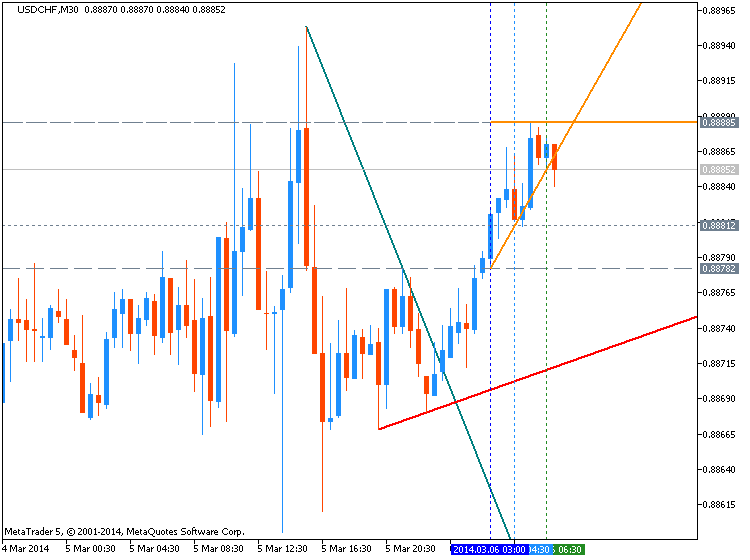 Adding a long USDCHF trade here would in effect double our existing exposure, so we will continue to stand aside. The US Dollar continued to push higher against the Swiss Franc, with prices rising to a one-month high en route to the 0.90 figure. Near-term resistance is in the 0.8983-94 area, marked by the 38.2% Fibonacci expansion and the June 13 close. A break above that on a daily closing basis aims for the 0.9022-36 region, bracketed by the 50% level and the June 5 top. Alternatively, a reversal back below the 23.6% Fib at 0.8934 clears the way for a test of the 14.6% expansion at 0.8904. Prices are too close to resistance to justify entering long from a risk/reward perspective. On the other hand, the absence of a defined bearish reversal signal argues against taking up the short side. We will remain flat for now. The US Dollar is attempting to extend its advance against the Swiss Franc having launched to the highest level in nearly two months yesterday. A daily close above resistance in the 0.9022-36 area, marked by the 50% Fibonacci expansion and the June 5 high, exposes the 61.8% level at 0.9061. Alternatively, a turn below the 38.2% Fib at 0.8983 opens the door for a test of the 23.6% expansion at 0.8934.